The Han Dynasty was not only famous for its scientific and artistic advancements, but also for the geographic expansion that happened during this era. This dynasty’s geography – which was composed of the Western and the Eastern Han Dynasty - was characterized by a great expansion and a complicated system of fiefs and princedoms. During the period of the Western Han Dynasty, the capital city was located in Chang’an. The area was administered in regions with subordinate princedoms and commanderies. Major areas of the principal fiefdoms are currently known as the provinces of Jiangsu, Hebei, and Shandong. The kings were appointed and given a kingdom to administer. The capital region was called Sili and the main commandery unit was known as the Jingzhao government. 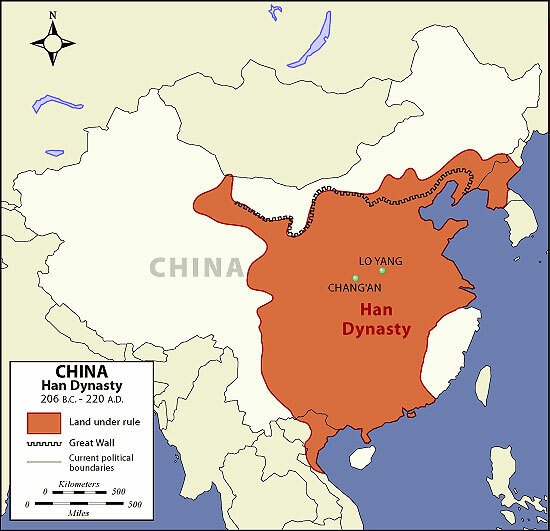 Han Dynasty geography was expanded during Emperor Han Wudi’s reign. The expansion first took place after the defeat of Xiongnu. After this, Chinese armies advanced into the Gansu province in North Korea. These expansions included Guangzhou and the Yunnan provinces and the northern area of current Vietnam. The Western Han military was sent to the northern neighbors to conquer the nomad confederation enemies and also expand their territories. The southern part of the Korean peninsula was also taken under the Three Han tribes. At the time of this shift from the Western and the Eastern Han era, the governmental structure established under the former empire was retained. However, there were some changes introduced by the new empire. During this era, the capital moved to the city of Luoyang. The administration area of the Western regions shifted to Qiuci while the dependent non-Chinese kingdoms were installed in the border regions. Unfortunately, numerous rebellions, such as infamous the Yellow Turban Rebellion, led to the downfall of the Han Dynasty. Despite being overthrown, some facts such as those mentioned above still contribute to the legend in the Han dynasty. In the end, Han Dynasty geography still stands as a testament to the might of this former superpower.